Physical activity is just as important—if not more important—in your old age as it is throughout the rest of your life. But for many elderly people, the act of going to a gym is either unappealing or impossible. This compact workout station was designed to provide seniors with an exercise alternative right in the comfort of their own home. According to Fast Company, the dynamic table was created by a team of industrial design students at Virginia Tech as part of the Stanford Center on Longevity's third annual Design Challenge. 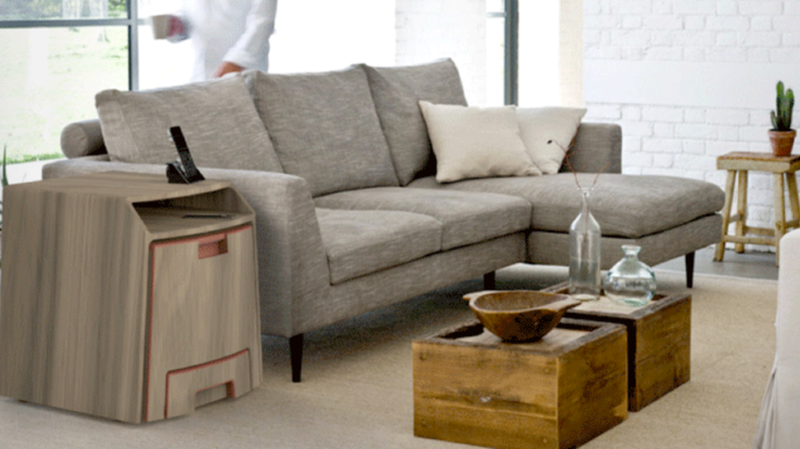 The invention, called Veevo, resembles a basic end table when it's not in use. To transform it into a piece of exercise equipment, seniors can simply pull on the handle and unfold its components. The chair is meant for low-impact, seated exercise, and its seat opens up to reveal a compartment for storing weights and yoga equipment. From beneath the chair, a step stool pulls out and can be used for more intense activities, and a handrail lifts out from the side to lend support. The concept was partly inspired by a team member's grandmother, who had broken her wrist after falling and lost the ability to care for herself for several weeks. Looking to promote independence in the elderly, the team decided to take a proactive approach toward dealing with debilitating falls. According to the Centers for Disease Control, one in three men and one in two women stop exercising completely by age 75. A compact home gym could give seniors who might have remained sedentary a convenient way to improve their strength and balance. Veevo is one of 12 finalists currently competing in Stanford's challenge, which looks at student-designed projects that promote healthier, longer lives. If their concept wins, the students hope to one day make their product a reality for the seniors who could benefit from it.